Recently, big brands, such as Aerie and SI Swimsuit, have been including models with disabilities in their marketing campaigns. 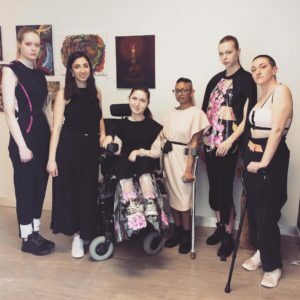 Instead of just showcasing disabled models, Canadian designers are taking it one step further by creating clothes for them. These clothes are called adaptive clothing. They are existing styles that have been reconstructed so that disabled people have an easier time to get into them. Adaptive clothing is not new, but Canadian designers are giving a makeover to this fashion category. “What is available in all the research out there is very depressing. They make for seniors that I’m 100% sure even seniors don’t want to wear them. It’s monochrome colours and awful patterns,” fashion designer Mana Mojaver commented on the existing adaptive fashion market. Mojaver has been working with Rushmita Alam on an adaptive clothing brand, Essentiel Édit. They are in the process of interviewing participants with varying abilities to learn about their lifestyle and needs. Based on the provided answers, Mojaver and Alam will then come up with designs that’ll be shown to participants for feedback. Prototypes will be made and tested by participants, who will offer constructive criticism. It’s a continuous relationship with end users to arrive at designs both parties are happy with. “We try to design some things that bring happiness like boost their energy and confidence with the colour, with the style, so they’re proud of what they’re wearing, not hiding themself,” Mojaver explained. The designers are working on a capsule collection for women first. They hope to make it available to the public by March 2019, with the plan of releasing menswear, childrenswear, shoes and accessories after. What’s coming sooner is Izzy Camilleri’s IZ Adaptive, relaunching sometime this month. The collection offers new ‘standing frame’ styles and some original pieces from the 2016 line, that catered to people in wheelchairs. This release is exciting because there aren’t many adaptive clothing designers like Camilleri. She is established in the mainstream fashion industry having work seen on television shows and being featured in publications like Forbes. “There are several companies I know that are working on [adaptive] lines that will launch next year,” Camilleri revealed. Ahead of them is recent fashion graduate, Sonia Prancho, from Ryerson University. She debuted her collection, UN•FORM, this past spring at the Mass Exodus 2018 fashion show. For instance, Prancho designed a pair of pants that can expand and detract, using velcro, to accommodate weight changes from medication. In addition, she incorporated magnets into the designs to help those with finger dexterity issues. Although function was a priority, style was still on top of the list. UN•FORM has pinks and floral prints, making the pieces fashion statements. They are perfect for a young demographic, a market that has been missing in the adaptive clothing industry. “That’s a reason why I wanted to do this. Because it’s either for old people or for really young people, like kids who just learned they have a disability…but there’s nothing really for us at all,” Prancho said. Thankfully, UN•FORM is not the only one filling in this void. Designs from Essentiel Édit will be for people who are 30 years and older. Meanwhile, IZ Adaptive is targeting a broad age range of 20 to 60 years old. So go ahead and take advantage of your prime.